After many years of use the old hexagonal casualty markers are being retired and replaced with some of the excellent dials available through Warbases in the UK. The old style ones were great however they did have several limitations. Firstly the footprint was quite large on the table and the need to turn the various edge against the rear rank of the unit that it was administering sometimes caused a few issues. On several occasions I had moved the unit and then had to struggle to remember whether it had suffered 3 casualties or 4. No big deal however wargaming accessory technology has developed and has me ready to embrace a change in direction. A few here however I still have at least another 40 to put together for the Austrians, Russians, Bavarians etc. A good example of the larger footprint which I wanted to move away from. I think this fine cavalry casualty model will find its way onto its own vignette. 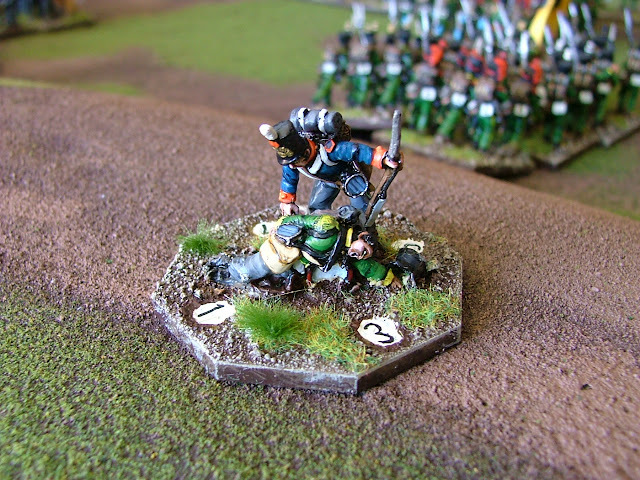 Hopefully this weekend will see the bases painted, flocked and tufted and ready for the next game of General D'Armee. 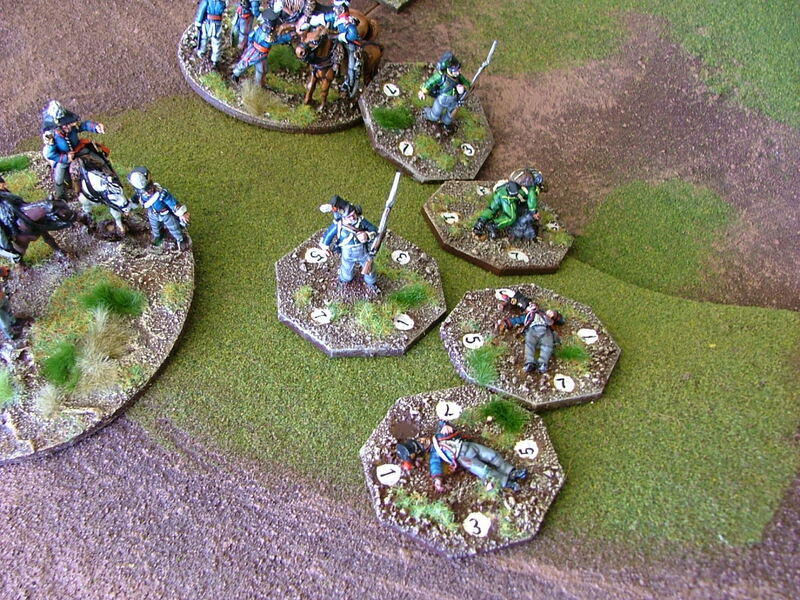 Nice work, each of my units has it's own casualty marker too. 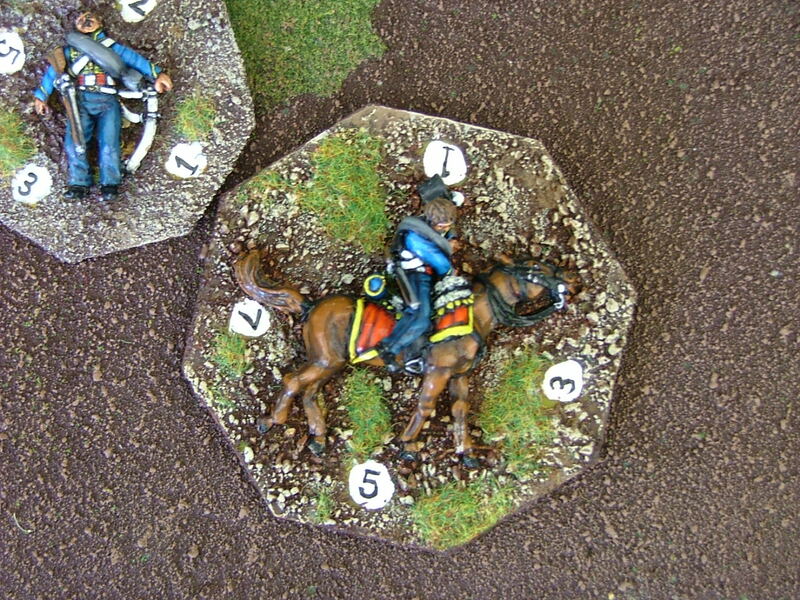 Charlie Foxtrot models do an oblong dial casualty base which is great for horses. Might not be big enough for the model with attached rider though. Thank you Anthony for your positive comments and the heads up on the oblong base at CFM - I’ll head over and have a recce. Thank you Sergiuss and I hope to get some good use out of them in coming weeks. I'm impressed. I've only ever developed a few prototype markers, never going into full production as you have here. It sure does improve the look of a game. Thank you Mark. I am trying to get the markers and other "accoutrements de guerre" settled for these rules pretty soon. I am sure from what I have seen on your excellent blog your efforts will make mine look quite average. Look forward to seeing what you come up with A. A great looking set Carlo, and full marks for the effort in transferring your whole collection. Being a cheapskate and doubling up my bases for 18th century and Napoleonic, I don't have landscaped dials but swap the relevant figures with blu-tak as required. I should have known that you would have both a sensible and aesthetic approach to this Chris! What a fine idea for future reference mate. I am looking forward to a renewed effort on my limber teams this Christmas break ala Kevin East style so stay tuned my friend. I think both the old and new styles look great, Carlo! You are, as always, a gentleman Peter. I think the dials will work better for GdA and you may also have noticed that I do have some double sided dials so that when casualties are over 12 I can place that one so one knows its next casualty is automatically 13+. Should work well. I have wondered about the Warbases dials. Do they move too freely, i.e. are they likely to stray off their current setting easily in the heat of battle? Hi Peter and believe me, the way I command there are never enough ether! They have the right amount of "stiffness" if that's what you mean and I find after the sand, glue and paint in the finishing invariably they are slightly stiffer again thanks to a rogue grain sticking between the respective dials. The height took a little bit of getting used to however the benefits far outweigh and issues with that. They look great, in a broken and dispirited way of course, I do like the dials and have picked a few up largely by accident, but I think I need to paint some more standing up blokes first! Broken and dispirited is a perfect description of these chaps Iain. Yes, the fuses are going yo work very well and hopefully they will be completed this afternoon whilst listening to the cricket from Adelaide. Amazing effort Carlo. They look great. I have all of mine on square but have just got the cavalry sized ones so will run with them in future.